Its that time once again! That time of year where the cold bitterness of winter begins to taper off and the warm rays of sunlight slowly begin to take its place. It is during this time of transition in which we witness what’s sometimes referred to as the “Spring Phoenix” as rising from the ashes of the harsh dismal winter, green sprouts of life began to appear. As flowers begin to emerge and bloom, clearly it’s a beautiful time to not only be alive, but to truly feel alive! Therefore, perhaps it is only fitting that in this season of celebrating life, that we take the time to reflect on one of the most fundamental issues of our lives; our health. In keeping up with the hustle and bustle of daily life (work, family, finances, etc) its easy to sometimes take one’s health for granted. However, with the innumerable health hazards that one may encounter in life, it’s always in one’s best interest to maintain a keen level of awareness of any serious illnesses. As you probably know, cancer in all its forms is one of the most serious and potentially life-threatening illnesses affecting the world population today. However, what you might not know is that there are but few types of cancer deadlier than that of oral cancer! Therefore, in response, April has been officially named “Oral Cancer Awareness Month” among the dental community. While this may be the first you’ve heard of it, it won’t be the last and you can rest assured it is certainly a cause worth knowing about! Oral cancer is an extremely aggressive type of cancer that can manifest within the throat, cheeks, lips, or tongue, and may continue to spread throughout the body. With an annual death toll of approximately 7,500 deaths occurring within the U.S. alone, oral cancer is clearly not an issue to be taken lightly. However, despite the imminent danger presented by oral cancer, like an unexpected storm looming in the distance, oral cancer often sneaks up on a person with little warning. Until its too late that is! This is generally because the initial symptoms of oral cancer often seem relatively mild and seem little more than a minor nuisance. Such early symptoms may include: a slight hoarseness or gravelly tone to your voice, and perhaps the appearance of ulcers or swelling around the mouth and neck region. While such minor nuisances may not exactly seem as a serious cause for alarm, they can in fact be more than they appear. As mentioned previously, deception is a key factor in oral cancer’s modus operandi. When a patient first begins developing oral cancer, the symptoms are typically minor and thereby left unchecked or dismissed. However, the patient may actually be in the early stages of developing oral cancer, without being aware of it! Unfortunately (like so many before them) the patient, unaware of their affliction does not seek treatment right away, thus allowing the cancer to continue to progress. It may only be when the persistent symptoms start to worsen, that the patient finally seeks out the necessary medical care. Tragically this required treatment may only come when the disease has already progressed into its latter stages, in which the cancer has proceeded to ravage the patient’s overall health, causing irreversible and often fatal damage. This scenario, (grim as it may sound) is an important one to hear and learn from, as it illustrates the trap that many oral cancer patients have fallen victim to in the past. However, with the advent of oral cancer awareness month, and the continued advancements in dental technology, the time to rise and fight back against oral cancer has never been better! The common oral cancer screening may in fact be the dental profession’s best kept secret, as the majority of patients are unaware that they are receiving the screening even as it happens! An oral cancer screening is a quick and painless procedure that Dr. Kimes preforms as part of your standard dental exam at Overland Park Dentistry. When you come in for your routine dental checkup, you are simultaneously receiving an accurate screening for any early signs or symptoms of oral cancer, which is something that can be a deciding factor. 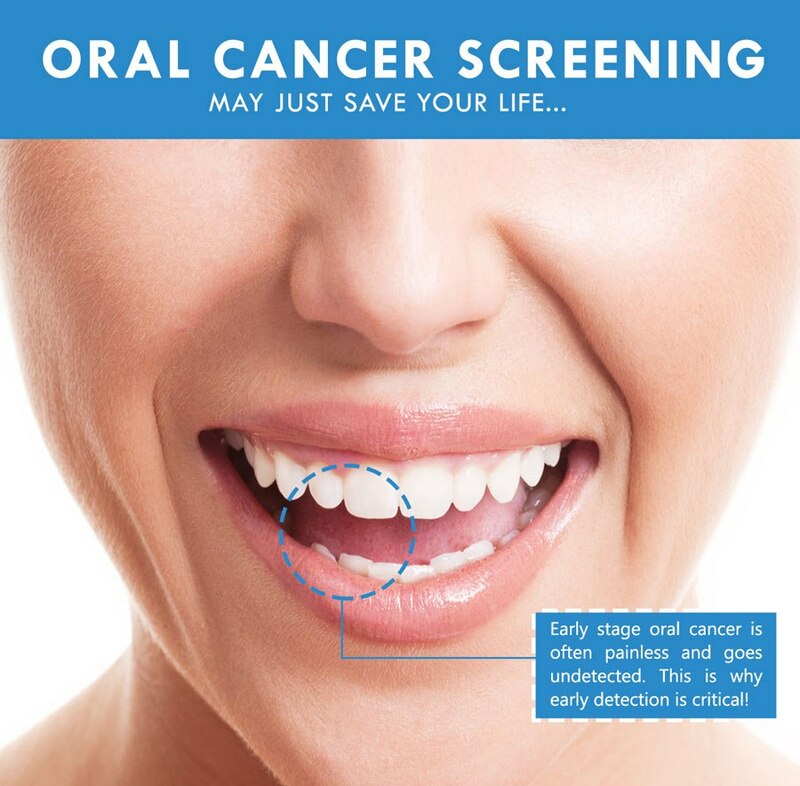 Identifying and treating oral cancer within its earliest stages is often the best bet in fully overcoming the disease, as the cancer is not given the time to cause damage and spread, therefore it is paramount that you let Dr. Kimes take the time to give you that crucial oral cancer screening during your next dental appointment! Oral Cancer Screening: Help Us Help You! While much of the information provided above may not exactly present the bright and cheerful message that you may be accustomed to this time of year, please remember that the purpose of this article is to remind you that there’s still time to change this! Therefore, if you do have any concerns or anxiety over your chances of developing oral cancer, taking the time to schedule a routine dental checkup and oral cancer screening, is unquestionably the right decision.